That Bengal is the core area of the cult of Kali the dark devi is well-known. But was the goddess always offered puja in the form prevalent today? Actually, up till the 17th century CE she was worshipped in the symbolic form of a pot. How that changed is the stuff of fascinating legend. Thrilled with delight and anticipation, Krishnananda set out as the first streaks of dawn lit up the eastern horizon. Outside a village hut he saw the newly wedded bride of a cowherd starting to smear cowdung on its walls. Her right foot was extended, the left bent back (in Bharatanatyam this is the alidha pose). The left hand held a ball of cowdung and the right hand was raised up and inclined forward, holding a small pat of cowdung to plaster the wall. Her hair, undone, spread all over her back. In haste, wanting to finish the work quickly before the household awoke, her forehead glimmered with perspiration. While wiping it off with the back of her hand (as it was full of cowdung) the spot of sindoor on her forehead had got smeared, reddening her eyebrows. Krishnananda did namaskar to her. Finding that a stranger had seen her face, the bride bit her elongated tongue in shame. Krishnananda had found the exact form for his icon. Returning home, he gave that shape to it in which she is worshipped still in Nabadwip as Agameshvari Kali Ma. This form is also called Dakshina Kali, the benevolent form of the devi as distinct from the form worshipped in crematoria. Krishnananda’s brother Sahasraksha was a staunch Vaishnava. Once, in Krishnananda’s absence, his brother offered the bananas he had kept aside to offer the goddess to his deity, Gopala (Krishna as the cowherd). After a heated argument, both sat down and began invoking their deities. At midnight both had a vision of Kali feeding bananas to Gopala cradled in her lap. They realised that the two were one. The worship of this dual form is recorded in the Gopala-Kalika Kalpa. The Mahabhagavata and the Devi Puranas relate that once Shiva, wonder-struck by Parvati’s beauty, wished to experience femininity. He told her that he would like to assume female form and she should be male and be the husband. She agreed and said that her thundercloud complexioned form of Bhadra Kali (benevolent Kali) would descend to earth as Krishna. Shiva descended in nine forms as Radha and eight others like Rukmini and Satyabhama, the wives of Krishna. The devi took birth from Devaki as a son and from Yashoda as a daughter. 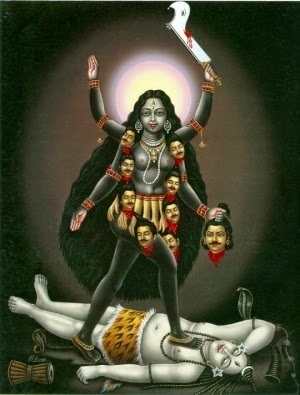 To assuage Devaki’s fears, the son showed his true form as the terrifying four-armed Kali with three eyes, terrifying mien, astride a corpse, with hair free flowing, a crown, and a garland of skulls. When the Pandavas prayed to the devi at Kamakhya, Bhagavati appeared and assured Yudhishthira of victory, saying that to support him she had taken male birth from Devaki. At the end, Brahma approached Krishna in Dvaraka and told him that at Shambhu’s request and for relieving earth’s burden the Devi had taken birth as a mortal. As the task had been completed, she should now return. Krishna then smiled and asked Drupada’s daughter, born of his portion, whether she would stay back or follow him. Draupadi said, “I am your portion. You are the original Kalika. Like a bubble merging into water, I will merge into you.” At the seashore, Krishna became Kali and sped to Kailasa on a lion-drawn chariot. Draupadi, touching the sea waters, merged into her. Thus, Krishna and Kali are one. Enjoyed reading this piece, Pradip.